Ready or not, roundabouts are coming to Florida. And it’s best to be ready for them. Last year, the Florida Department of Transportation adopted a roundabout policy and is encouraging its use on future road projects, directing other areas to build at least two roundabouts within a five-year span. Lake County recently welcomed its newest roundabout at the intersection of county roads 455 and 561. And let’s not forget roundabouts already located in Thornton Park, the town of Windermere, Baldwin Park and Winter Garden. Determine where you want to go. Approach the roundabout as you would a typical four-way intersection. Stay to the right on the splitter island and SLOW DOWN to 10-15 mph. If you are making a right turn, you should be in the right lane; if you are making a left turn, you should be in the left lane; through movements can be made from either lane. Watch for bicyclists and allow for them to merge into the entry lane. Watch for and yield to pedestrians in the crosswalk or waiting to cross. YIELD to traffic already in the roundabout. Do not turn left at the splitter island. Once you are in the roundabout, do not stop, except to avoid a collision; you have the right-of-way over entering traffic. Travel in a counter clockwise direction. Do not change lanes. 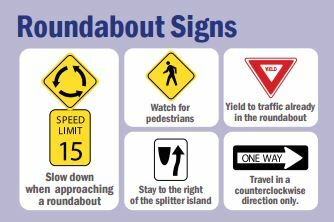 Look for your street, use your right-turn signal and exit the roundabout. As you exit the roundabout, watch for and yield to pedestrians and bicyclists. If you miss your street, simply travel around the roundabout again and exit at the desired street. Stay on the designated walkways at all times, crossing only at designated crosswalks. Never cross to the central island. Watch for cars; you have the right-of-way, but your best protection is your own attention. Cross the crosswalk one lane at a time, using the splitter island as a refuge area before crossing the next lane. If comfortable riding in traffic, you may ride on the circulatory roadway of the roundabout like a car. As you approach the roundabout, merge into the entry lane before the shoulder or bike lane ends. Communicate your intentions to drivers by pointing to your destination. If uncomfortable riding in traffic, dismount your bicycle at the crosswalk and move to the sidewalk. Once on the sidewalk, walk your bicycle like a pedestrian. How does a blind person safely cross with no stop light and no pattern to listen to? The law states motorists must yield to pedestrians crossing with a guide dog, white cane and/or mobility aide (walker, wheelchair, cane), but most drivers will just keep going. Thank you for your response. You are right – most drivers here in Orlando do not yield for pedestrians in crosswalks, and we can only imagine the difficulties one faces while trying to cross the street with a vision impairment. What we can tell you is that Lighthouse Central Florida offers training sessions for the vision-impaired to learn to cross the street safely. You can visit their site at http://www.lighthousecentralflorida.org/. In the meantime, BFF is moving the needle slowly but surely to increase education and awareness about pedestrian rights to the road. It about time progressive traffic planning comes to Florida. Round Abouts, provide 40% more traffic flow through a given intersection, reduce accidents 36%, reduce serious injuries 70% and reduce deaths by 90%. I heard that there are Federal Regulations being developed to address accessibility issues for visually impaired individuals. Have you heard anything about this? If so, would you please send me a link that I may track? Also, what is the projected date of publication for public feedback? As for a projected date of publication, there wasn’t a specific project outlined in this article. Each project would have different dates. Was there a specific project you were wondering about? Please let us know and we will do our best to get this information to you.